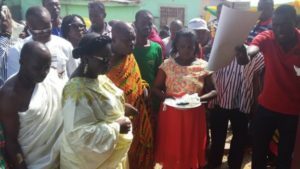 The Member of Parliament (MP) for Asokwa, Madam Patricia Appiagyei last Sunday commissioned a ten seat biogas engineered toilet facility at old Asokwa in the Asokwa Municipality. The facility also has six bathrooms to serve the people at the old-Asokwa community. Speaking at the commissioning ceremony earlier, Madam Appiagyei noted the commitment of her outfit as well as that of the Ministry of Science, Technology and Innovation to put up facilities that are environmentally friendly across the country. The cost of the project, she announced was GHC 170.000.00, adding MPs common fund and the Social Intervention Fund (SIF) were used for the construction. ‘’ I assure everyone here that as your servant I will us my good offices to lobby for more of such projects to be constructed in other areas in the Asokwa municipality’’, Mama Pat noted to deafening applause. Chairing the occasion, Nana Fe-Baamoah II, Chief of Asokwa commended the MP for the project. He noted the residents had longed for such a project since almost all the earlier toilet facilities constructed were in ruins. The Chief called on members who will be part of the committee to oversee the running of the facility to be transparent with their activities. He also stressed on the importance of keeping the facility in shape, adding proper maintenance regime should be kept to make the place clean at all times. ‘’I charge those who will manage this facility to deal transparently with us and ensure they regularly maintain the place so it does not suffer similar fate as others that were constructed earlier in the community’’, the Asokwa Chief noted passionately. Speaking on behalf of the Asokwa Municipal Chief Executive, Mr Charles Oteng, Asokwa Municipal Coordinating Director (MCD) pledged the assembly’s support in maintaining the facility. He commended the MP for the initiative and called on the yet to be set up committee to be prudent in their supervision. Oscar Riches, Assemblyman for the Asokwa Electoral Area thanked the MP for showing commitment to the project and ensuring its completion. He urged residents to keep the place tidy at all times, adding the way they keep the place will ensure how long the project lasts. Present at the commissioning ceremony were Mr Elliot Fosu Barnor, Presiding Member (PM) for the Asokwa Municipal Assembly, Chairman Asare Bediako, immediate past Asokwa NPP chairman, Papa Yaw Asare Bediako, Asokwa NPP Secretary as well as many NPP sympathizers.